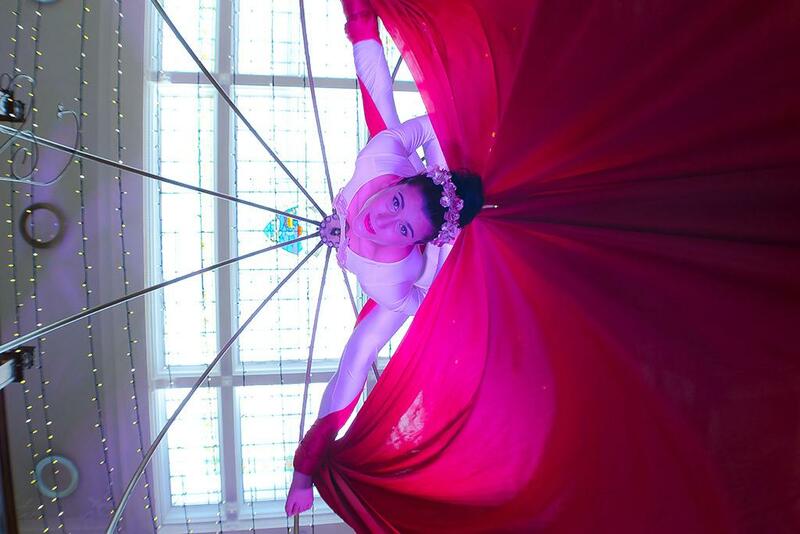 The Gilded Birdcage is a stunning event centerpiece for exquisite aerial hoop or silks performances. Decorated with beautifully intricate filigrees and standing at just over four meters high, the Birdcage is an incredibly impressive focal point in even the largest of spaces and will transform any room into a decadent and magical environment.So if you are looking for a truly jaw dropping act to bring something totally unique to your event and wow your guests then look no further than The Gildeed Birdcage! 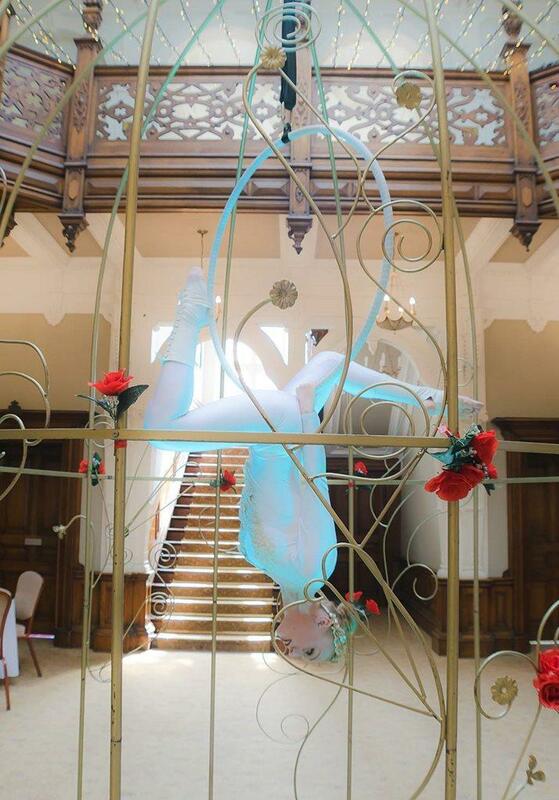 Beautiful aerial starlets perform breathtaking routines whilst rotating in the cage and wowing guests from every angle. Each of our bird cage performers are highly skilled, ‘in demand’ artists in their own right. This clever prop creates a completely self-contained aerial performance space because the artists are suspended from rigging within it. 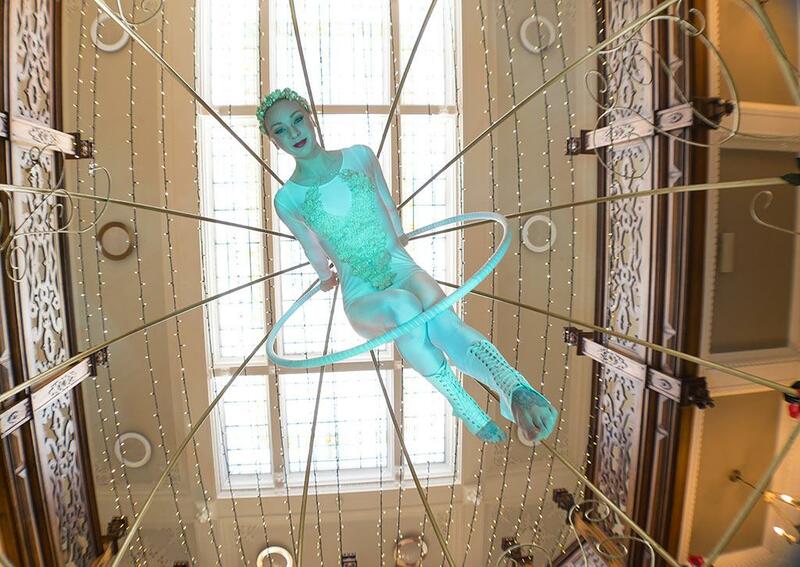 This makes the Birdcage perfect for events which want aerial but do not have rigging within the venue. 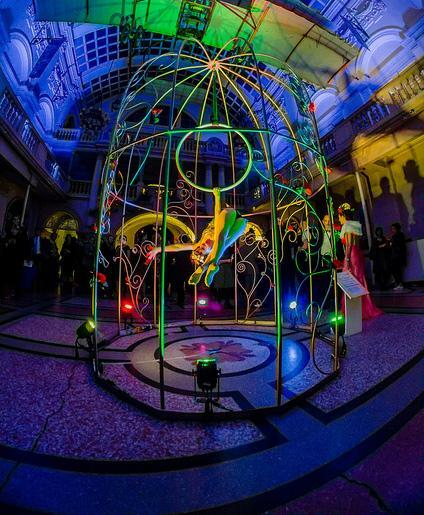 The magnificent giant cage is available to hire for all manner of occasions such as private parties, weddings, corporate entertainment, launches and film, is suitable for both indoor and outdoor use and can be decorated to suit any theme. Hire includes 1-2 aerial artists who will perform 3-6x 15 minute sets throughout the day and an experienced technician to ensure the set up and take down runs smoothly. We manage all the logistics for delivery and construction of the structure at your event and will liaise with you and your venue as much as possible beforehand, which means that on the day things run seamlessly and our team will get the Birdcage up swiftly and safely, causing minimal disruption to the rest of your setup. – The cage is approximately 2m diameter and 4.2m height. It collapses down completely. The largest “part” is a ladder just over 3m tall that is used to help set it up. – It requires two people to put it up and takes approximately 45 minutes to an hour and it would be set up before the beginning of the event. – For more festive events the entire cage can be covered in fairy lights. these are throughout the event, please note that for a solo performer you must allow a minimum of 15 minutes between sets. ★ Decorated with beautifully intricate filigrees, the cage stands just over 4 metres high! I would like to thank the team for being such a pleasure to work with. 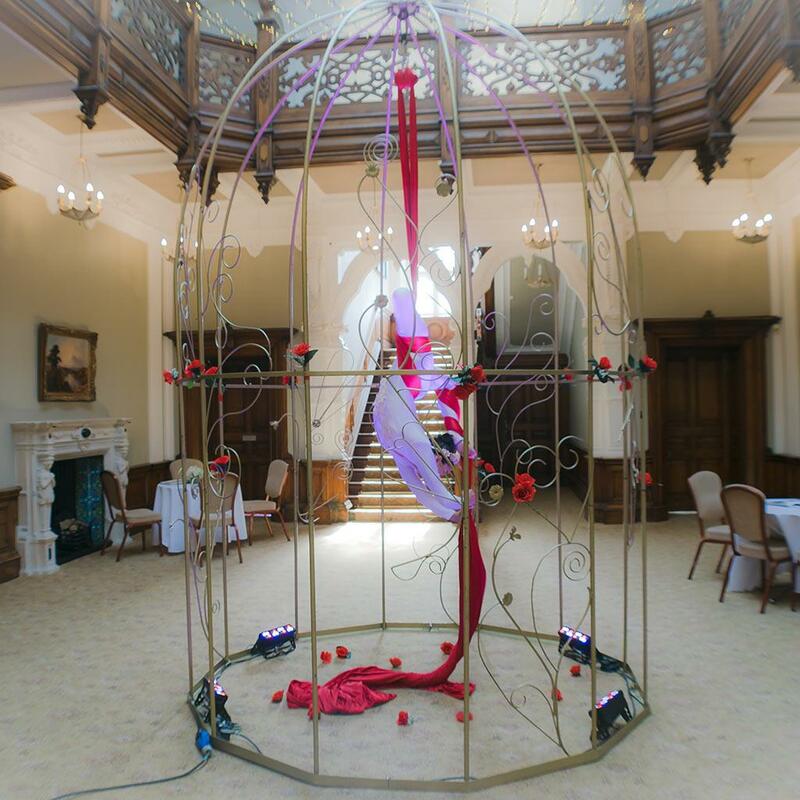 The birdcage is a beautiful structure which made such a brilliant focal point at the centre of our event. The artist performing inside the cage was a wonder to watch, feedback from our guests has all been hugely positive. We were on a particularly tight timescale with set up and tear down, but the team were professional and skilled and really helped to make our event run smoothly. Thank you for being so accommodating and thank you for providing an excellent show for our event.